Sherrie Scraps with passion: Hello Foxy card AND another Cricut-tastic Blog Award! Hello Foxy card AND another Cricut-tastic Blog Award! I hope your having a great day!! Today I made a card from the Birthday Bash cartridge using my gypsy. My card is 5". I cut the scallop at 4.47 x 4.65, which I embossed with swiss dots folder and the layer at 3.65 x 3.79 using my gypsy. I cut the cute little fox at 3 3/4 plus the layers. Isn't he just So cute? I used a SU punches for around the sentiment. The sentiment~Hello Foxy is from My Pink Stamper~Punnylicious set. Wow, I am so honored that I received this award once again. This time Stephanie at http://onceuponapaper.blogspot.com/ passed it along to me. Thank you so much!!! Please be sure to stop over to see what STEPHANIE has on her blog. She is very talented and has some great ideas to share. Being I just received this award recently, Please click HERE to hop over to the other blogs I passed this award onto. Super cute card.Love Love that Birthday Bash cart. What a cute card, love it.. Congrats on the Award as well. Sherrie, I love the fox!! 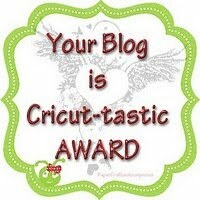 I wanted to let you know that I also have an award for you over at my blog. I wanted to express that I really like your blog. I wanted to pick people that maybe didn't get an award yet but I really felt like you deserved another one. So thanks for having a great blog!!! Congrats on the award! And I ABSOLUTELY love that fox! How fun! I have a little guy that would love something like that on his card! He loves heavy metal and this just totally reminds me of him! Love the fox. So cute.. What a great card.. This is just so cute! That fox is rockin!